THE publication of Mr. W. M. Mackenzie's ingenious and revolutionary theory about the battle of Bannockburn has drawn the attention of scholars to the tactics of the battle at the appropriate moment of its six hundredth anniversary. I venture to construct a new theory of the battle, which seems to me compatible with the authorities on which Mr. Mackenzie relies and also in harmony with new evidence of charters and other records. The stress of the present argument rests upon the limits of the New Park. Any one who is familiar with the history of the battle will realise the importance of evidence for the exact situation of the New Park. Mr. Mackenzie's plan places the New Park a considerable distance to the north of the farm now known as Coxithill, and about a mile and a half from the Bannock. I believe that the New Park extended from Coxit Hill to the Bannock. As the Scots encamped the night before the battle in the New Park, and as Mr. Mackenzie says that everyone is substantially in agreement that the battle was fought on the ground between the encampments, it is clear that a change in the site of the New Park affects the whole argument. A detailed discussion of the evidence of the ancient charters and the more modern sasines must be reserved for publication elsewhere. 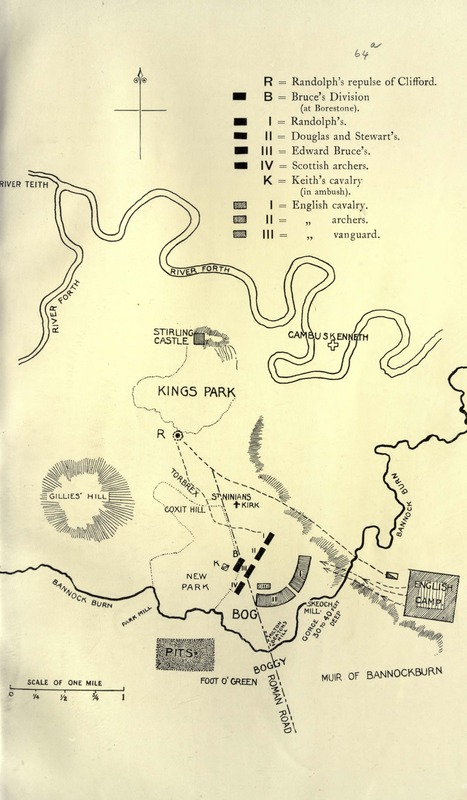 Meanwhile, the following summary will indicate the main points on which is based the theory of the locality of the New Park, which is the basis of a new reading of the battle, that locality is an area enclosed between Borestone, Parkmill, and Coxithill, and it can be shown to have been under trees at the date of the battle. The accompanying sketch map illustrates the sense of the charters and sasines which transmit the New Park and the adjacent lands to successive owners from Bruce's day to our own. Twenty-five years before Bannockburn made it famous, the New P'ark had very well ascertained boundaries. Its circumference was carefully measured, and the measure of its length in feet has been preserved i the Exchequer Rolls. In the account of the Sheriiff of Stirling for 1289, there is an entry of a payment for putting up a fence 7200 feet long to enclose it. Fourteen years after he used it as his base at the battle of Bannockburn, King Robert granted the New Park, by charter to a vassal named Adam Barber. The conveyance of the New Park by charter implies the existence of boundaries, either described in the charter or so familiar in the district as not to require description. There is no description, probably because the New Park may still have been enclosed n 1328. The charter simply states that the New Park is to be held according to all its right marches. A charter by David II., granted in 1369, proves that the land was then under wood. A charter of 1455 shows that the New Park nad been acquired by William Murray of Touchadam, and since that date it has always been in the possession of the Murrays, whose title-deeds include the original charter of 29th July, 1328. The situation and the boundaries of the New Park can be discovered from documents relating to the surrounding properties, the limits of which were not so well known as those of the New Park itself; and therefore required description. The lands of Torbrekkis (Torbrex) were given by Robert Bruce to a William Bisset, c1315-1321, and a charter of Robert Bisset in 1533 shows that New Park was on the south and south-east of Torbrex. A sasine of 1709 indicates that the south and south-eastern boundaries of Torbrex ran slightly to the south of the road from St. Ninians to Touch, marching with the lands of Cocksithill. We have therefore reached this point—that the charter of 1533 speaks of the lands of Torbrex as being bounded by the lands of Coxit. But the original charter of 1328 grants the lands of Kokschote, near Kyrktoun, along with the lands of Newpark, and the Murray sasines show that the names were used interchangeably, Newpark being the usual description where title is concerned, and Coxit being employed in descriptions of boundaries. Other sasines show the distinction between the lands of Newpark and the lands of Blackdub of Touchadam which form their eastern boundary, and the distinction between Newpark and the lands of Haggs and Graysteall which bound it on the west. The whole series of charters and sasines is consistent in leading us to the conclusion that the lands given in Bruce's charter of 1328 as Newpark and Coxit, near Kyrktoun, were approximately the present farms of Parkmill, New Park, and Coxithill, lying to the south and south-east of Torbrex. In other words, the New Park lay between the road from St. Ninians to Touch and the road from St. Ninians to Chartershall, and the traditional Borestone is near the middle of the eastern boundary of the Park. In what follows, this localisation of the New Park will be assumed. On the night of Friday the 21st June, 1314, the army of Edward II. lay at Edinburgh, and on Saturday the 22nd it was marching upon Falkirk. When Bruce received this information he conducted his troops from Torwood on the English line of march to a point also on the English line of inarch, but much nearer Stirling Castle, the relief of which was the immediate purpose of the enemy. The ground to which he removed was well known as the New Park. Bruce's choice was dictated by the advantage given by a wood to an army of foot soldiers when the enemy is powerful in cavalry, a circumstance insisted upon, almost in identical terms, by Bruce in Barbour's poem and by Wellington in a conversation about the battle of Waterloo. Other considerations also recommended the choice of the New Park. A camp so placed had access to a good water supply in the Bannock Burn and the Kirk Burn, and there was plenty of firewood for cooking purposes. The danger lay in a descent of the English upon the New Park from the high ground immediately to the south by way of Chartershall, where or whereabouts (and where alone in this locality) the Bannock could be crossed by an army in good order. This was certainly the natural point for Bruce to render impassable. In his account of the pits, Barbour indicates that their purpose was to prevent an attack on the Scottish right, to block an army route, not to form a trap on a battlefield; he makes Bruce say on the Sunday evening that there is no place for alarm: the strength of their position must prevent the enemy from 'environing' them. A tract on ground by the present old Kilsyth road was dug all over into little pits the depth of a man's knee, fitted with stakes sharpened at the top and covered deftly by turf. So thickly were the 'pottis' or holes dotted that Barbour compared the tract where they were made to a bee's honeycomb, the 'pottis' (the lid', of the ' pottis' were 'green.' so that they did not show) were perfectly placed to protect the right wing of Bruce's army—the only point exposed to immediate attack; and we read that on going out to inspect them on Sunday morning after they were made, Bruce was satisfied on seeing how admirably they answered their end. Meanwhile the English army was approaching. They were met well out from the Scottish position near Torwood by Sir Philip de Mowbray, governor of Stirling Castle, who could inform them of Bruce's dispositions and of the blocking by the Scots of the best route by which to approach their position. Stratagem must defeat stratagem. To get immediately within striking distance of the Scots position was not to be a simple matter. To the east of the hard level crossing blocked by the pits, the bog of Milton, then a sort of natural mill-dam, arrested the approach of an army in strength, while from the mill, running due north-east to the carse, was the gorge of the Bannock. This impediment, following a winding course a mile in length, was impassable by troops. To the artist this canon stretching on the one hand towards Beaton's mill at its upper extremity to Skeoch mill on the other and beyond to the carse, suggests only a scene strikingly picturesque, but to one looking for the military possibilities of the landscape it presents an overwhelming barrier to an advancing army. To bring the Scots immediately to a genera] action was impossible, in view of the news brought by Sir Philip Mowbray. But honour and safety were in conflict. The following day was the expiring day of the contract sealed between Sir Edward Bruce and Sir Philip. Honour and delay of a general conflict must therefore be reconciled. This led to the counter stratagem of the enemy. Sir Philip, who was personally responsible for the English being mustered here in Stirlingshire in force such as had never before crossed the borders, must vindicate his part of the treaty with Sir Edward—capitulation of Stirling Castle: if not relieved by the 24th--and it was probably his suggestion that if a detachment of cavalry were flung forward to the Castle by the carse this would redeem his pledge and save the honour of England. The carse he knew well, and could act as guide to the detachment or leave for that purpose a trustworthy member of the garrison who had accompanied him in this sally. This would allow the main body of the army to choose between an immediate engagement, if that were possible, and a delay in striking the contemplated blow. The skill with which this stratagem was managed by the English has scarcely been sufficiently appreciated. That King Robert was watchful of the enemy we know, and his scouts must have been on the alert; yet this detachment had already passed the Scots position when first reconnoitred by them. This seemed to spell disaster; and the rebuke which Bruce administered to his nephew, the Earl of Moray, must have made his blood tingle. Moray, who occupied the Scottish left, which the English had just passed, now had the opportunity of showing the stuff of which he and his men were made. They instantly formed and advanced towards the Castle. The English detachment was over confident; and 'the bloodless ride over' which Sir Philip had suggested as a redemption of his pledge, must be supplemented by an attempt to surround the Scots position. To obtain this object it was necessary for Clifford either to await Randolph's advance or charge him. The latter alternative was the one decided on. The Scots knights, marching on foot, formed into a circle, with spears protruding and their wall of shields protecting them. The English cavalry dashed upon them, but at the first encounter Sir William Deyncourt, a knight of great repute, was brought to earth, his horse slain with him. As a result of repeated charges many horses and riders lay upon the plain. Among the persons taken was Sir Thomas Gray, whose son in his narrative tells of an altercation among the English leaders at the moment of attack. Sir Thomas was averse to an encounter, although there was no braver knight in the English ranks; as a prisoner of war he paid for his advice not having been followed. The fighting had been no tournament affair; it was a determined struggle of mounted knights against knights on foot, and the former were utterly routed by the latter. But the Scots camp was not only in danger of an assault on the north, it was simultaneously attacked from the east. The vanguard of the enemy was eager to share in the honour of at once surrounding the Scots position; and as this squadron advanced at a trot, the mounted knights from the high ground of the Roman Road at Snabhead saw some Scots moving about in a provoking way on the east skirts of the New Park, as if already in flight. Had Clifford's column succeeded in its object? Warned by Sir Philip to avoid the pits, this second column filed over the bannock— where a large army could not have crossed—at Craigfoord and Milton Mill, ascending the high ridge on the other side, formerly known as Lawhill. A quarter of a mile up the Bannock the Roman Road crossed. But the Romans, with their preference for straight lines, had run this road through a quagmire. The tract of ground on the south bank where it crossed the Bannock was known in 1727 as 'the place of the streets of the sinks,' while the ground skirting 'the street' is denominated 'bog' and 'weet-lands.' Once on Lawhill, the ground in front is firm, and with but a gentle gradient is suitable for a charge by mounted troops. King Robert's station was at the Borestone. He rode about on a nimble pony in front of his position, reconnoitring the enemy's advance while holding his own troops in readiness in the margin of the wood. The point appui at Lawhill such that a rider stationed at the Borestone is silhouetted into treacherous relief Bruce, wearing a crown above his helmet, was immediately recognised by the most advanced English knights, especially when he rode out from the wood to a point some distance in front to have a better view of them. Here was a rare chance for single combat with the Scots King, and quick as thought Sir Henry de Bohun, cousin of the Earl of Hereford, gave his horse the spur. The king headed his palfrey into line with the advancing war-horse. When a horse-length distant, the king, with a swift jerk of the reins, avoided his assailant's spear, rose in his stirrups and with his battle-axe struck de Bohun as he passed. The knight fell lifeless, his skull broken to pieces. When the English vanguard saw that de Bohun was dead, they fled, and the Scots, frantic with enthusiasm on seeing the English champion fall by the hand of their king, rushed from their camp with loud shouts and pursued the retreating column as far as the defile. The two detachments having broken away, the English army, following in the wake of the vanguard, reached the lands of Plane (so known in 1215), where Edward halted his entire force and called a meeting of his staff.' When Bruce directed the formation of the pits, he had calculated on their effect in dislocating the English plans: this meeting of Edward with his staff was the result. The English strategists carefully considered the new conditions in which they found themselves. Never before had the route by Chartershall been obstructed, and the information conveyed to them by Sir Philip Mowbray had come upon them as a surprise. Edward for his part desired the immediate arbitrament of battle. But he could not get within striking distance of Bruce by the expected route on that day, and to camp at any point above the gorge on the lands of Bannockburn would render him powerless to attack the Scots position on the morrow, tor the gorge, twisting to and fro for another mile, barred all passage for his army by dryfield to the Scots front. It has not been sufficiently observed that when the English vanguard approached the Scots front by the narrow defile at Beaton's Mill and occupied Lawhill they were unopposed by the Scots. The Scots, on the other hand, made a feint of flight, Bruce meantime observing the movements of the mounted column from the Borestone. The single combat, with its attendant results, was a brilliant accident—the outrush of the Scots and the evacuation of Lawhill by the vanguard. But Bruce neither then, nor at any time that day, nor that night, nor up rill the dawn of the 24th, opposed the enemy's taking up a position in his front. It is here that the locality of the New Park is of first importance. The ground in the Scots front, devoid of trees, being outside the New Park—the eastern march of which was the old Kilsyth road, had a wavy surface including Lawhill and Balquhiderock Hills—rising contours but in addition three gentle depressions (1) Whins of Milton hollow, through which the present Denny road runs, (2) the hollow between the Bannockburn and Denny roads, (3) the hollow below the Bannockburn road, where the farmhouse known as The Hole. is situated. Mr Mackenzie, conceding this area as also part of the New Park, and finding that the fourteenth century writers are in agreement that Bruce went out of the New Park to fight, is thus obliged to seek the battlefield in the carse. He calls the part of the carse where he places the fighting 'the dryfield lands of the Old Statistical Account.' But there is no dryfield in the carse. The soil is all carse clay, on which cavalry could not, even to-day, be conveniently moved. Mr. Mackenzie's view that there is dryfield in the carse (a point which is essential to his argument) depends, I think, upon a mis-reading of the words of the Statistical Account (1796). All King Robert's plans and wishes were that the English should take the area now described as in the Scots front. The English writer who points out the Scots feint of withdrawal gives us the due to Bruce's plan of battle. After matters had righted themselves by the rout of Cliford at Battleflats, after Bruce had slain de Bohun and remade his dispositions, addressing his troops, according to Barbour, he used words which, when put in their proper place alongside the English writer's observation, disclose his whole plan of battle. As these words form the best guide to the site of the Battle of Bannockburn we quote them in full, all the more emphatically because an accurate fourteenth century topography is necessary to appreciate the significance. Bruce then feeling that his dispositions were justified by the events of the past day, which had rendered the impending battle a calculation of hours, inferring too the enemy's design from the position of their camp, said: We need not apprehend an attack from the enemy except in front. The strength of the position, as you see, is such as shall keep us from being surrounded. When we have found that his frontal attitude throughout the 23rd and up to the dawn of the 24th was a false retiral or, at the most, a lying on the defensive under shelter of the wood, while he thus spoke of his front to his troops as the Achilles-heel of his position, the strategical design of his dispositions is unmasked. Bruce had strategically given up to the enemy the entire ground in his front, an area in itself larger than the New Park. It is this area, roughly speaking a parallelogram, bounded on the west by the old Kilsyth road, on the east by the mile of Bannockburn gorge, on the south by Milton bog and Milton lead or 'strawnd.' and on the north by the margin (or slope) separating dryiield from carse, that Barbour describes as 'a mekill feild on breid.' It lay there carte blanche. No demonstrations were made upon:. No pits were dug there, nor is it necessary to assume, as Mr. Mackenzie does, that the English vanguard on the 23rd 'unconsciously' avoided them. By placing the pits south of Charters-hall Bruce designed to shift the scene of conflict from a very strong position for the enemy on his right, with no barrier to intercept their flight if defeated to an excellent tournament ground on his front where if defeated no way of retreat lay open to them, while he himself in the event of defeat could retire among the New Park trees only a hundred yards in his rear. In time, his plan was not, as it appeared, to evade a battle, but to accept a battle on ground of his own selecting. But not content with making a free gift to the enemy of the area before the Borestnne, he took a further precaution to conceal his intention from them by giving it out in the evening that he was on the point of evacuating the New Park for the Lennox. He thus distinguishes the 'dryfield' of the next day's fighting from the camp, which was situated in the carse, which he describes as a morass (xi. 287). This distinction perplexed Mr. Mackenzie, who explains it on his hypothesis that 'the battle took place on the plain between St. Ninians slope and the carse.' There is no such plain. The slope is the margin which separates two of the great agricultural sections of Stirlingshire, carse and dry field—the plain lies not between St. Ninians and the carse, but between the Borestone and Bannockburn village. During the night 'the plane hara feild' across the Bannock, before the Scots position (reached at this point by a piece of green slope which looks to-day as if it might have been, artificially graded for the purpose), was rapidly occupied by the English as a substitute for their adjoining marsh camp. The English archers advanced first ('ante aciem') in the twilight of the midsummer right, ranging themselves on the ridge from Lawhill to Braehead farmhouse; the vanguard covered by the archers, and burring to redeem yesterday's retreat, advanced to a position slightly lower than the bowmen, while the battalions following the King's standard occupied the ground known as Balquhiderock Hills. When day broke, Bruce again stationing himself at the Borestone, saw his plan of battle realised. A short march, wholly unexpected by the English, for Bruce had hitherto appeared anxious to screen his troops in the shelter of the wood. King Robert was sensible of the terrible game he was playing in leading his troops from cover. But these troops the evening before in his presence had expressed the earnest resolve to die upon that plain, or set their country free. The first movements on the field were by troops on the higher ground. Well in front of the New Park trees, on the gentle eastern slopes of Caldom Hill, the battle began. Gloucester gave the order to his men to charge. The Scottish division on the right, led by Sir Edward Bruce, received the charge. The battle now became general. Randolph was posted on the Scottish left and the lower ground. King Edward, at the moment of attack, occupied the slightly undulating plain fronting the Earl of Moray. The division led by Douglas and Stewart now advanced, and thus the Scots ranks, when the English vanguard—the elite of the enemy—had been hurled back upon the large 'schiltrum,' behind, were engaged from a point several hundred yards in advance of the Borestone to a point near the marsh of the carse below. A mass of dead and dying horses and men marked the line where the battle was joined. but at that grave moment Sir Robert Keith, at a command from Bruce, wheeled round the south slope of Caldom Hill and took the archers in flank and rear. This coup-de-main led to important results. A total rout of the English archers ensued. Throwing down their arms, they ran into their own cavalry's position To save themselves from being cut down many fled. Thus, at the most critical moment of the day, by a skilfully laid ambush, the most efficient and most powerful arm of the enemy was in an instant put out of action. Two new phases of the conflict now supervened. The Scottish archers took up a position in the Scottish rear, and shot their arrows over the lower schitrums of spearmen into the ranks of the English mounted knights. The Scots knights on foot were still maintaining themselves along the whole line with the most determined courage and coolness. At this juncture what appeared to the enemy as a new Scottish army was seen issuing from the hills to the west, palpably to aid Bruce. The English battalions now reeled. Some on either flank fled. But at many points the tendency to rout was for a time stayed by the English leaders. This gave the opportunity to King Edward's personal attendants to urge him, much against the grain, to leave the stricken field. A brave attempt was made to rally the day by de Argentine, who, having seen his sovereign: safely off the field, returned to the battle. He fell. Gloucester fell. The English ranks broken, the studied plan of Bruce's dispositions was now to tell with overwhelming effect. As the eye to-day sweeps up and down the zig--zag mile of the great natural gorge which hemmed in the English rear, it is clear that, to an army routed or in flight, such a tremendous ravine would form a barrier of the most calamitous kind; especially when one remembers that the southern boundary of the battlefield which dovetails with the gorge is 'the strawnd,' and that again led into Milton bog, while beyond these is the course of the Bannock, and still further the line of Bruce's pits. In the Register of Salines the edge of the canon behind the English is expressively described as 'the rigne of the brea' (eg. Sasine 12 May, 1685). It is this feature of the battlefield which impressed itself upon the Paginations of Sir Thomas Gray, the Lanercost writer, the writer of the Life of Edward II., and Barbour himself, as they heard the battle described, and they have vividly set forth what they heard. Sir Thomas Gray sums up this phase of the battle in one masterly sentence. The English front ranks could not clear themselves, he says, their horses being transfixed on the Scottish spears; and as the fallen horses kicked out, and the fallen knights clutched at their comrades in the effort to rise again, the rear ranks recoiled, and in recoiling plunged over 'the rigne of the brea' into the ravine of Bannock burn, every one tumbling upon the other. It was at once a defeat and a carnage. The lads, swains, and baggage followers now arrived on the battlefield, an down among the cumbered knights and struggling horses in the ravine and slew them, where they could offer no resistance. On the two flanks, where pressure upon the gorge was less, flight was possible, and it was resolved by King Robert to pursue all sections of the enemy, giving him no time to rally. Sir James Douglas was detached in pursuit of the King of England, who had first ridden to Stirling Castle, but was now riding south for safety. The pursuit was followed to Dunbar. Sir Edward Bruce was detached in pursuit of the Earl of Hereford. He came up with the fugitive at Bothwell Castle. The earl and all his company were taken prisoners. A great body of troops leaving the right flank fled towards the Forth. In doing so they unwittingly entered a cul-de-sac as fatal as that from which they had just escaped. They found themselves shut by their pursuers in an angle made by two rivers. The Bannock receives the tide daily a mile up its course (as far as Stewarthall bridge). Nor could the Forth be crossed: here by fugitives; it is too broad and deep. Most of those who tried to cross were drowned. A great number of the fugitives ran from the battlefield over the carse to Stirlirg Castle, and clinging to the castle rocks made a show of resistance. A strong company was sent by Bruce up the crags to attack them, upon which they yielded as prisoners. A number of Welsh troops headed by Sir Maurice de Berclay got across the gorge on foot and fled south. Many, including Sir Maurice, were taken prisoners, and many slain during their flight. The finest army England ever saw had ceased to exist, and .in a moment the destiny of Scotland was changed. Sir Philip de Mowbray, Warden of Stirling Castle, in fulfilment of his treaty with the king's brother, now tendered the castle to Bruce. As in one sense he had given the occasion for this mighty overthrow of his nation, he preferred to remain in Scotland, and tendered his sword to Bruce, whom he served with the brilliant qualities that he had formerly displayed in the service of England.